A vent grate in the building on Royal Street, like hundreds of others. Carriages are painted and pretty, and always around the streets of the French Quarter. The streets are old and cobbled, but washed every morning and clean. One of the best things about visiting New Orleans is in the details. It is a graphic-lover's city. Everywhere you look there are pretty things to see --scrolling ironwork, beautiful vents on the buildings -- even the manhole covers are nice looking! Maybe it is the Spanish historical influence (there isn't much left of the original French architecture) but it is an endlessly fascinating city to walk around in. People drape their balconies with beads and flowers. Restaurants decorate their windows. Shops lure you in with antiques and treasures that look one of a kind, whether they are or not is a small detail. This trip we spent time roaming on Royal Street. We took two long walks down that street and stopped in several shops. I bought some perfume at Hove, which is a perfumery that has been in business since 1930. The shop was old and beautiful, clean, not cluttered, and the shopkeepers are not pushy. New Orleans is a city for shop keepers, and they let you roam around and don't pressure you to buy anything. They are used to tourists and treat them well. We had lunch at the French Market Restaurant on Decatur Street. Tired from walking and hungry for oysters, we went in at lunch time. It was a beautiful large room with ceiling fans. The waiters and waitresses were friendly and no one minded at all when I asked questions about whether to order my mufaletta with french bread or the traditional sesame seed roll. They took their time, explained the differences and didn't act as if I was foolish to ask. We run into that kind of service everywhere. Cab drivers are eager to talk to you about places to go, and will give you good hints. This trip we found that there were no lines anywhere for anything. The city was quiet. Most weekends are not like that, there is usually always some kind of festival in New Orleans. We liked having the city to ourselves (not quite), and we enjoyed our quiet dinner at Commander's Palace with the four other parties in the room. Usually a bustling restaurant, it was fun to have all that service to ourselves! New Orleans is fascinating and unexpected, even when you have been there six times, like we have. We decided that the theme for this trip was: all stairs, no chairs. Neither of the two clubs we visited, Tip's or the Mid-City Rock and Bowl, had chairs. After a while we found a chair in both places and enjoyed the music. At Rock n Bowl we saw Amanda Shaw, the fiddler who plays in the new IMAX movie Hurricane On The Bayou. Our hotel was the Country Inn and Suites, where we had a suite, fine, but the bedroom had no windows--just a brick wall. At first I was a little appalled, but it turned out to be a fine large room which was quiet and dark when you needed it to be, and we slept like babies. This hotel is one of the few that offers a free breakfast, which we really enjoyed. They had wonderful oatmeal in a crock pot and another large container of yogurt with fresh fruit, along with all the muffins, scrambled eggs, sausage, waffles, etc. A good healthy breakfast is a must in New Orleans to fuel us for all that walking. A cab driver told us about a restaurant near our hotel that make great oyster omelets--ugh. This trip was unusual because there were no big events and no crowds, making it especially nice. Our cab driver who took us back to the hotel from Commander's Palace said it was so dead tonight, he was going to go home and watch TV. The weather was also wonderful, in the low 60s, with some clouds but no rain. New Orleans can be really hot and humid, so we enjoyed walking around this trip in the cool. I found a really fun slot machine to play at Harrahs, that blessed me by giving me a lot of free games with lots of money at first ($100), and then took it all away again -- alas. Don't you know that gambling is bad? But Harrahs is interesting, huge, and on the way to the river. They also had a Starbucks, a Fuddruckers, free bottles of water & a friendly attitude. I really enjoy walking along the MIssissippi and watching the river boats and the tug boats as they maneuver the swift currents. We flew first class on the way home, a great trip punctuated by a change of planes in Dallas when the windshield defrost didn't work, a delay of 2 hours. Home to the mountain of snow they call our front yard. I am happy that I bought some feather masks for my friends at work, and some masks for my wall at home. Something to remind me of the joie de vive that is New Orleans! During a village Christmas walk, we dropped into one of my favorite yarn shops and heard about a pattern for Bella's mittens, as seen in the Twilight movie. The first pair I made came out fine -- with a few mistakes. I had to learn a few tricks to get them right. The second pair was a disaster. I finished one mitten and realized I had missed several rows of a cable pattern and they were miniature and wrong wrong wrong. George convinced me that a big rip was necessary. I took a scissors to them and ripped back the whole mitten and ended a whole Saturday of knitting with a ball of yarn. 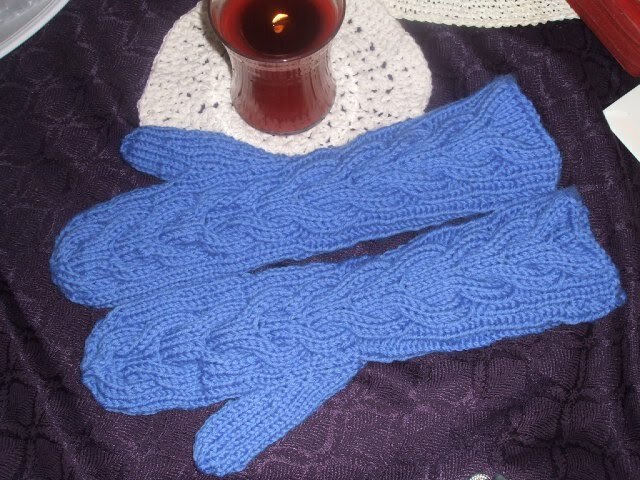 The third pair of mittens was finished tonight. They are made with two strands of yarn worked together. I started them on Sunday and knitted every evening and finished them on Friday night at eleven. The pattern is wonderful, but not easy. You have to follow it exactly and not make one stitch different than called for. The pattern has 87 rows and most do not repeat. It isn't a pattern that you can sit and talk while you knit. Concentration is key. I keep a stitch counter, markers and a cable needle handy. I learned the magic loop method for these mittens, which is a way of knitting a small circumference on circular needles instead of double points. There was a learning curve that I had to master, and I must admit, there was a little gnashing of teeth as stitches dropped, stitches were missed, and I had to rip back a thumb that I made too short. All worth the effort, however. It is fun to concentrate and learn to do something that is a challenge. I have two pair of finished Bella's mittens now, and two orders from people who want me to make them a pair. Knitting for hire isn't something that I have ever done, and I'm not at all sure that will work out. Knitting for love is better than knitting for money. But, what am I going to do with all these mittens? I might as well share. Maybe they call these Bella's mittens because they'll bring out the werewolf in any knitter!